ANNOUNCEMENT #1 – We will be playing an acoustic set at Pie & Vinyl on Sat 30th November. It’s an honour to play at our HQ/home/mothership again as it’s the official launch of their new, improved (and much bigger) premises. If you’ve not been in there yet then put this date in your diary as it will be splendid. I recommend the Matador pie. Tasty. It’s also the day after Black Friday which means lots of limited edition record releases etc…may still be there for your perusal. ANNOUNCEMENT #2 – We will be hosting our annual Christmas Party at The Wedgewood Rooms on Wed 18th December with an absolutely stellar line up….this year we are ridiculously proud to present to you…. If anyone caught their P&V instore earlier this year you know what a treat you’re in for. Having just toured with The Young Knives and performed at a host of festivals (I caught their set at End of the Road and it was something to marvel at…) – the band have released four mighty fine albums of vivid, English madness. When not busy crafting folk-pop nuggets, front man Oli has soundtracked the Mighty Boosh affiliated film (the series in which he has also starred) ‘Bunny and the Bull’ as well as winning awards for his film-making. We can’t tell you what a pleasure it is to have Mary come and play. Her debut album ‘Dream Life’ on the ace Hand of Glory label was a highlight of last year containing the 6Music-conquering single ‘Black Doe’ (an absolute stone cold classic in my eyes…). Blending dark-pysch-pop with bewitching fuzz-folk, her presence on the main stages of festivals like Hop Farm, Standon Calling and Bestival show she is a live force not to be missed. This man should need no introduction. A legend of cabaret-noir, his songs of black humour and spine-tingling brilliance will have you begging for more. You’ll either be in hysterics or concerned for your safety but you certainly won’t forget it. Performing at such disparate events as the Kerrang Awards, the Torture Garden Nighclub and playing alongside Duke Special and…er…Toyah Wilcox(! ), Joe’s chameleon-esque charm means that your xmas will be slightly more indecent this year. And that’s always a good thing right? 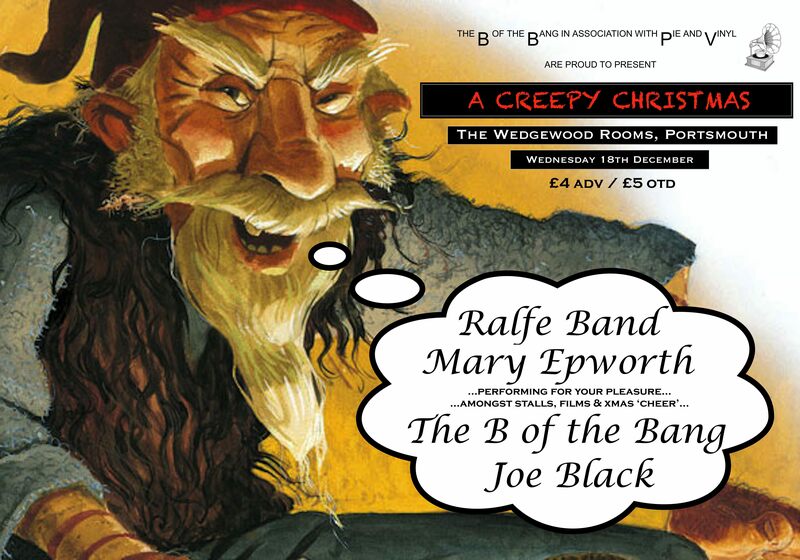 We really hope to see you at this one…it’s going to be a special evening…merry what-have-you! !